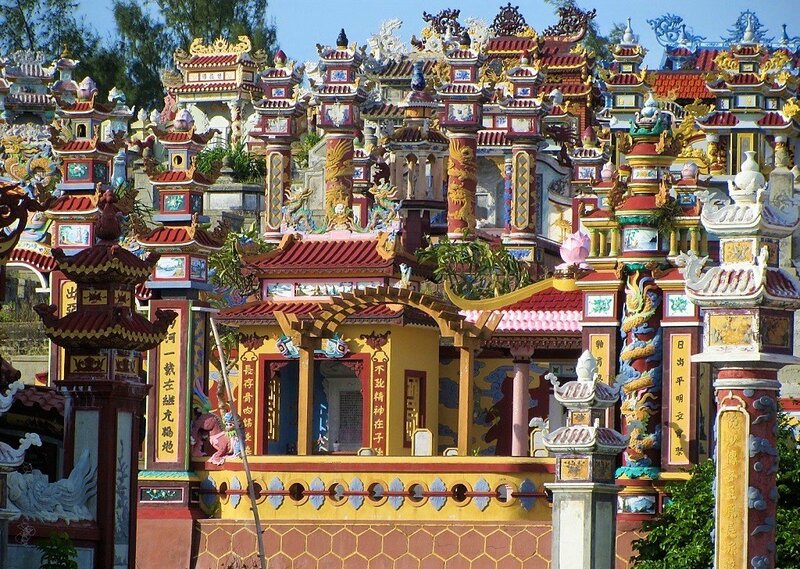 Thousands of elaborately decorated traditional Vietnamese tombs are scattered over the landscape along the central coast. Coastal back-roads, covering almost 200km of completely empty beach, lead from the old imperial capital of Hue to the up-and-coming coastal city of Dong Hoi, gateway to the caves of Phong Nha-Ke Bang National Park. The coastal region between these two cities is rarely explored by foreign visitors: most people, if they stop here at all, head to war-related sites around the former DMZ, between the coast and the mountains. This has left a barely believable stretch of unbroken beach almost entirely unvisited. 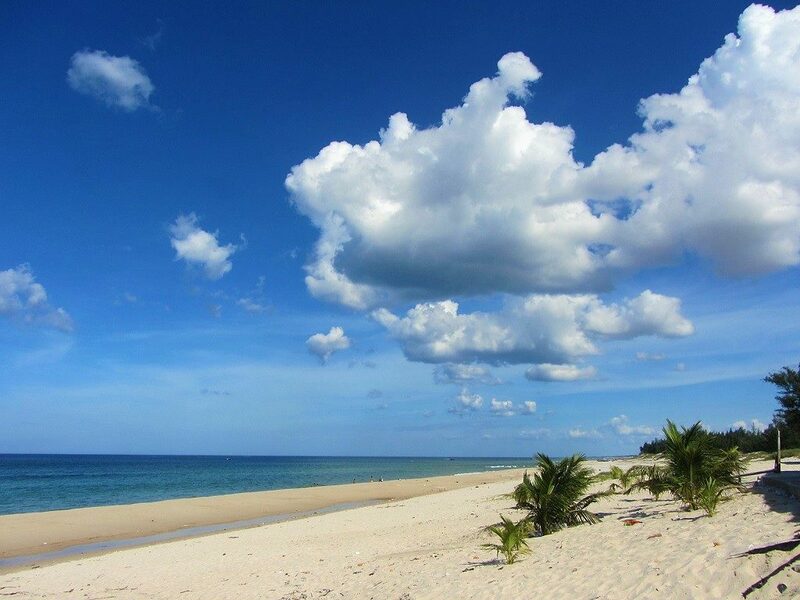 While Danang, Nha Trang and other darlings of Vietnam’s booming beach scene become increasingly touristed and built-up, this strip of central coastline remains essentially untouched. Characterized by calm blue sea and long arcs of bright sand where fishermen pull up their svelte-looking wood-and-weave fishing canoes, this road trip takes you on paved and dirt back-roads along an incredible coastline strewn with royal-style tombs. There are several ways to ride this route: as a one-way day/night road trip between Hue and Dong Hoi (185km), or as a loop (375km) by returning on the faster inland roads (see the red line on my map), or as part of the Beach Bum route between Saigon and Hanoi, or as a much larger loop by combining it with the spectacular Western Ho Chi Minh Road for the return leg via Phong Nha, Khe Sanh, and A Luoi. Time of year is important: visit during the spring and summer months (April-September) when the weather is hot and dry (most of the time) and the sea is calm and velvety. During the autumn and winter months (October-March), this region can get surprisingly cold, grey and grim, and winds churn the sea into a Hokusai-esque scene of white froth and towering waves. Also, the wet weather during these months can turn the sections of dirt road into slow-going muddy tracks. There are a few accommodation options on the Tomb Rider route, which I’ve included in the guide below, or if you have a tent, camping is good thanks to miles of isolated sandy beach and coastal casuarina forest. 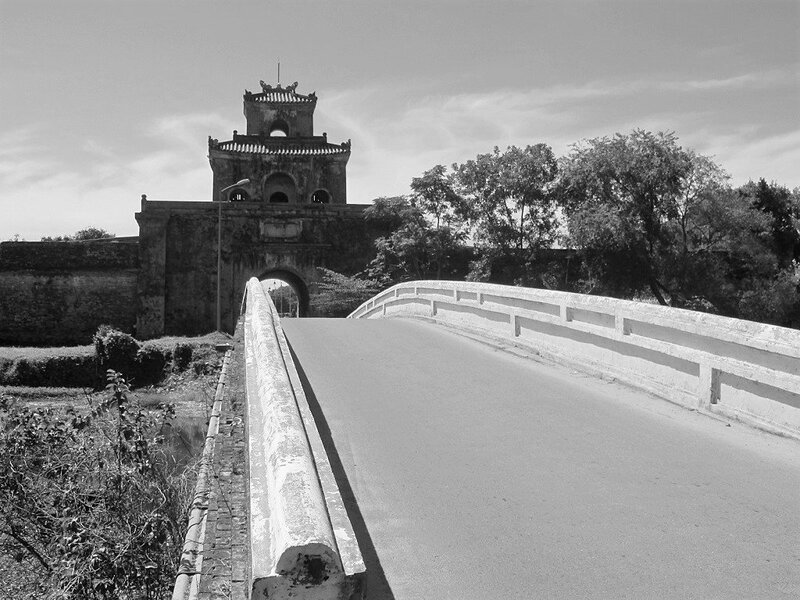 Leave the former imperial capital of Hue in the early morning. Hue is a relatively languid city by Vietnamese standards, but it can still get busy and clogged in the morning rush hour. Leaving early will avoid a chaotic start to this road trip. What’s more, the city looks its best in the fresh morning light: illuminating the trees along the Perfume River and the old stone walls of the royal ramparts and palaces and gateways. 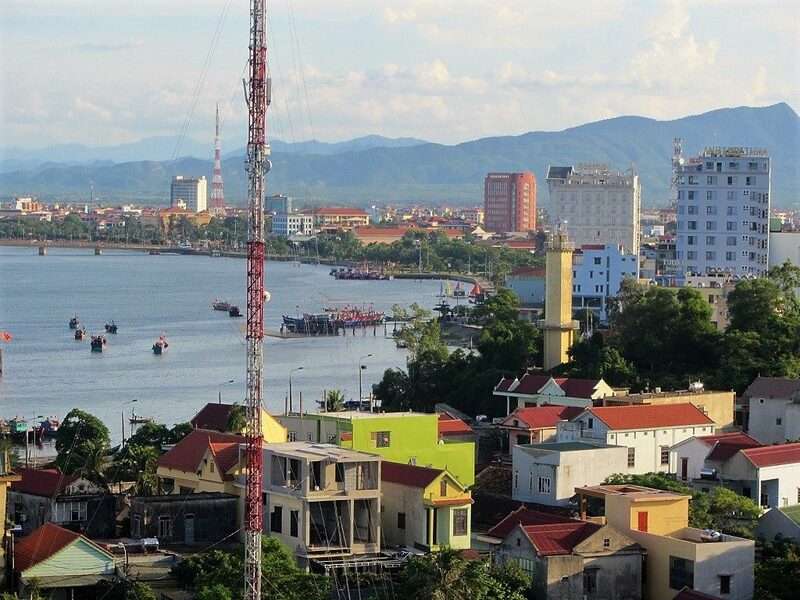 Hue is still one of the more aesthetically pleasing of Vietnam’s urban centres. Heading due north of the city along the Pho Loi River, the urbanity morphs quickly into semi-rural, riverside scenes. 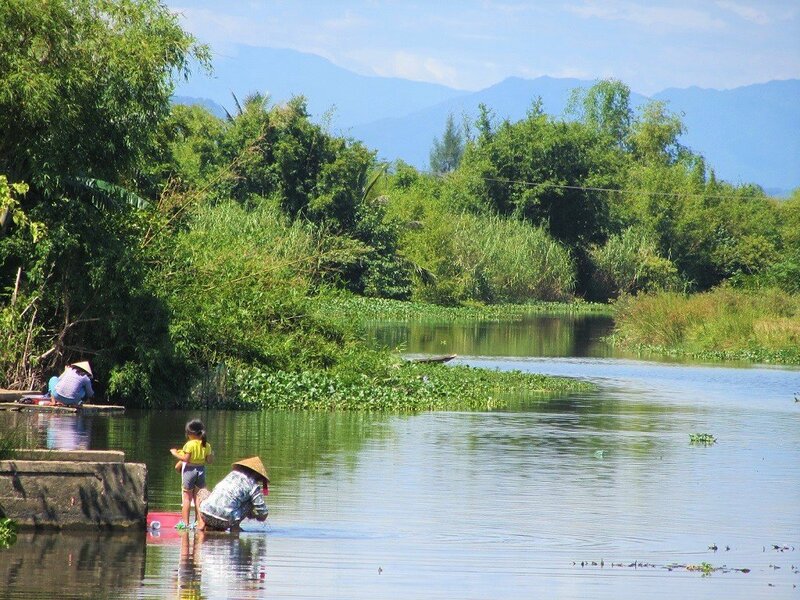 Little allotments and vegetable gardens grow by bodies of water – canals, streams, rivers, ponds, lakes, lagoons: the province of Thua Thien Hue is a watery world. In good weather, these scenes are warm and attractive: a benevolent countryside, bountiful and docile. But in the winter months, when typhoons sweep in from the East Sea and lash the low, flat, defenseless coastline, it feels vulnerable, fragile, and cold. Before reaching Thuan An, road QL49B veers northwest, crossing the Perfume River first and then the Tam Giang Lagoon on new, blade-like bridges. Tombs start to appear by the roadside and waterways. From monochromatic sarcophagi nestled in wet rice paddies, to colourfully-painted monoliths emblazoned with dragons and serpents, shooting up from the wetlands like an exotic crop. Once on the peninsular, the road ploughs straight and true, following the shores of the lagoon. Road conditions are excellent, traffic is light, and the vast, flat landscape with billowing clouds hanging above it, casting great blue shadows over the fields, dykes and watering holes, is reminiscent of 17th century Dutch landscape painting. Buffalo and cows populate the plains, while school children, on their way to class dressed in white and blue uniform, flood the sandy pathways and country lanes. From here all the way to Dong Hoi, you’re unlikely to see any other foreign travellers, save for a handful of road-trippers and tour groups visiting the Vinh Moc Tunnels. Bear right off QL49B towards the ocean. Here a narrow paved lane stretches all the way to the mouth of the Thach Han River, running parallel to the coast. Although this road can be a little bumpy at times, it’s easily rideable on any motorbike. 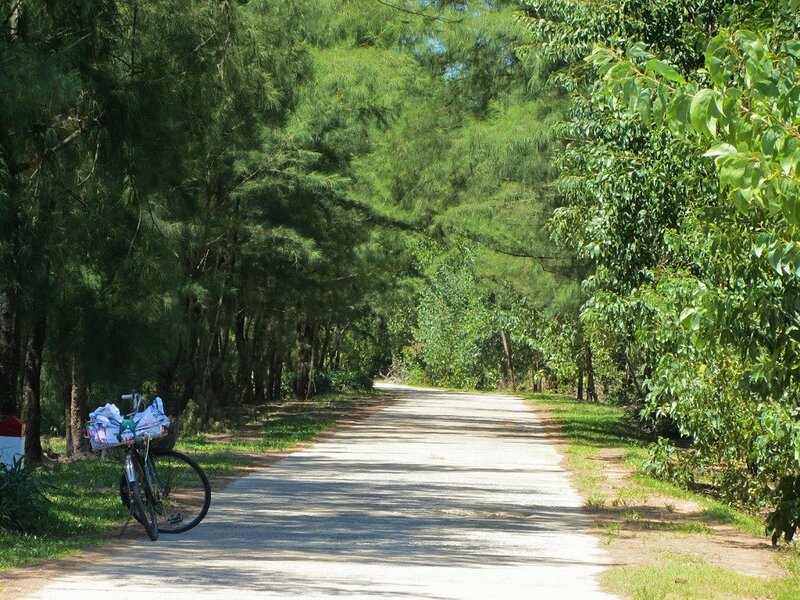 Threading through shady groves of casuarina and eucalyptus trees, there are little concrete pathways at regular intervals leading off to the beach. Take any of these and you’ll emerge from the trees onto seemingly endless swathes of white sand and sparkling blue sea. Clusters of picturesque fishing canoes, unlike any I’ve seen on the southern beaches, are pulled up onto the sand away from the wash. 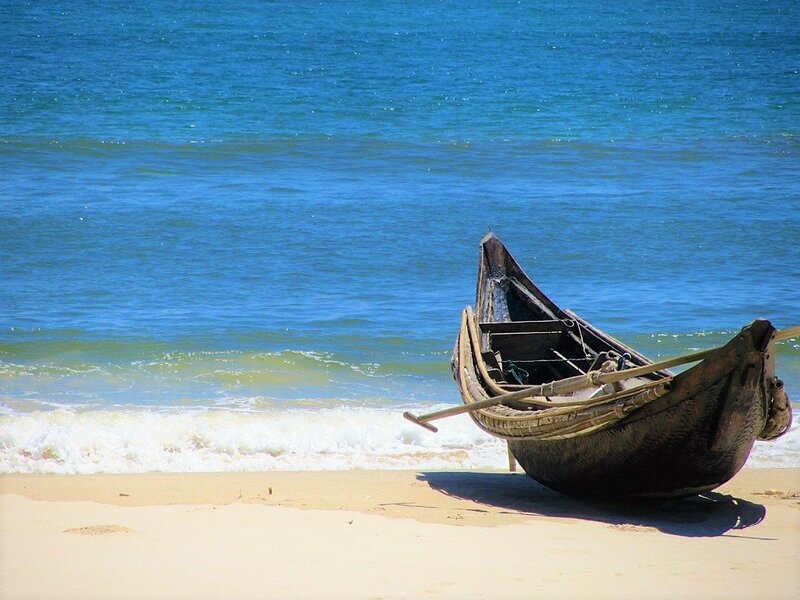 Occasionally, a tanned, leather-skinned local fishermen will be tending to his boat, or a conical-hatted woman sat on the sand fixing her nets, but in general the entire beach is deserted during the searing midday heat. Take your time, have a swim, and wallow in the quiet and open space. On the inland side of the road, the tombs are ever-present and ever more elaborate. Dotting the sand dunes behind the trees, or rising in formation on hillocks like terraced rice fields, the dead far outnumber the living in this dry, salty, sun-drenched region. But these are not ancient tombs; they’re recent. Indeed, dozens are still under construction. 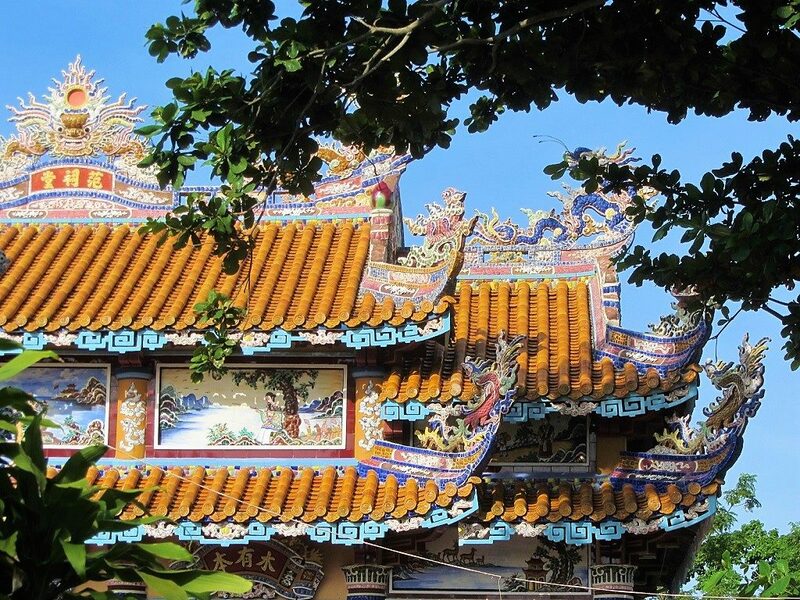 Wealthy Vietnamese buy plots of land for their entire families, and commission large mausoleums with intricate carvings and decorative motifs, depicting symbolic stories. 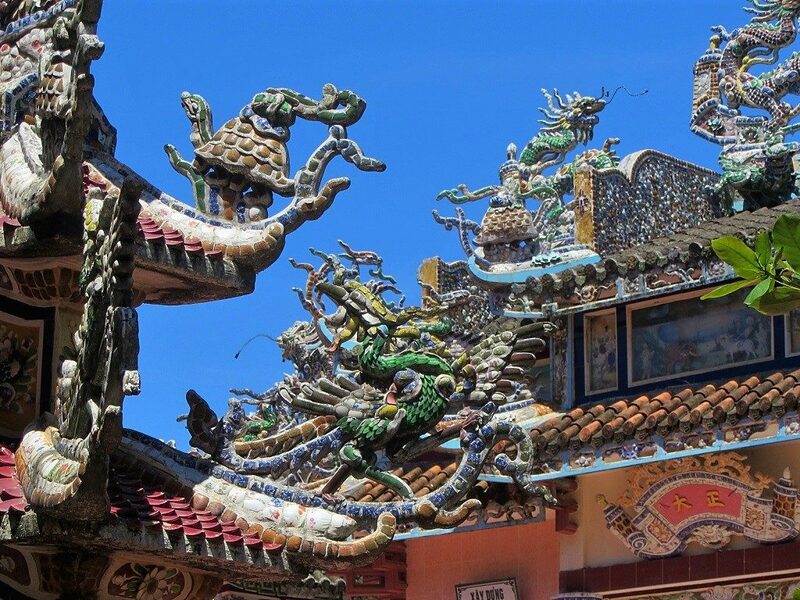 One of the most important considerations when choosing a site for a tomb is (as it was for the emperors who commissioned the famous royal tombs outside Hue) the principles of feng shui (or phong thủy in Vietnamese). Meaning literally ‘wind and water’, this is an ancient Chinese system which takes into account the lay of the land and other natural phenomena to assess the best location for a structure, among many other things. Just before crossing the Thach Han River as it empties into the sea, the route joins Road DT64. From here on the road conditions are excellent all the way until the dirt road sections, which begin nearer to Dong Hoi. A new bridge spans the estuary, on the other side of which is the small beach settlement of Cua Viet. There are some good seafood restaurants (nhà hàng hải sẳn) along the beach here, and a couple of empty-looking resorts and guest houses. If you fancy staying the night, Nhà Nghỉ Trung Hiêu (0985 740 777) will suit budget travellers, while mid-range riders can stop by at the Sepon Boutique Resort. 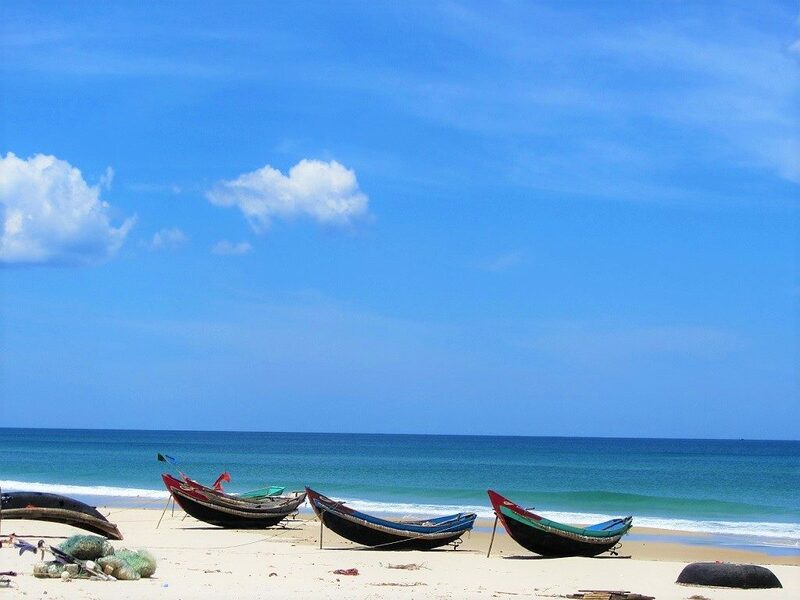 In good weather, the beach at Cua Viet is fantastic, with yet more picturesque slender fishing canoes and miles of empty sand. There’s also the possibility of taking a boat out to the strangely circular island of Con Co, which has only started to attract attention in recent years (inquire at your accommodation). After another 10km of empty ocean road passing under casuarina trees, the road spans a second river mouth, the Ben Hai. A surprisingly painterly estuary with tree-lined banks and flotillas of fishing vessels, there’s a small, slightly scruffy beach resort on the other side, called Cua Tung. There’s a military presence here, a reminder that this river was once one of the most heavily fortified areas in the world, between 1954 and 1975, when it was the dividing line between the Democratic Republic of Vietnam (to the north) and the Republic of Vietnam (to the south). Eo Bien Xanh Hotel (0533 823 811) is OK for a night if you need it. Just a few kilometres further up the beach, through a particularly lush and lovely stretch of coastline, is another relic of the long and painful wars of the 20th century. The Vinh Moc Tunnels were dug in the late 1960s, allowing local villagers to shelter from intense bombardments from American planes. The tunnels run for 2km at a depth of over 20 metres. They sheltered hundreds of people at any one time, mostly local families, whose children were schooled in the tunnels, and whose mothers gave birth in the tunnels. Vinh Moc is clearly signposted from the road. Entrance is 20,000vnd, including an English-language tour of the tunnels. 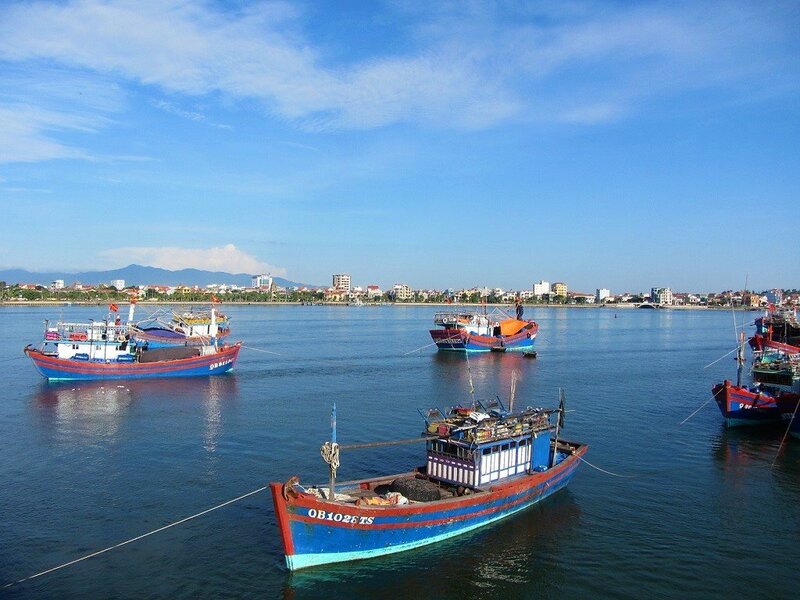 Le Thuy and Hai Ninh beaches both have some seafood shacks by the ocean, and there’s accommodation at Hai Ninh in the form of Song Ngư (0163 365 8686). The road goes through trees most of the way, but there are always little pathways leading to the long beaches, which if anything are even finer than the ones at the beginning of this route. Several kilometres before reaching Dong Hoi, the road widens into a new, four-lane expressway (called Vo Nguyen Giap), with no traffic whatsoever. This is Dong Hoi’s beach road, constructed with the future development of gigantic resorts in mind. So far there has been little activity, until you reach the traffic circle at My Canh, where Dong Hoi’s excellent municipal beach can be accessed as well as the sprawling Sun Star Resort. Turn left (due west) at the traffic circle and head across the bridge over the Nhat Le River to Dong Hoi city. (At the time of writing, a second bridge across the Nhat Le River was being constructed a little further downstream. It should be operational by the time you read this). Dong Hoi is a very appealing place to spend a night or two. Its location – on the banks of the river, with easy access to a good beach, and beautiful mountains close by – reminds me of a smaller, more manageable Danang. The riverfront promenade is very pretty, the boulevards are wide and relatively quiet, the back-streets have lots of good street food, and there’s a good range of hotels available. Budget travellers can try the familiar Western backpacker vibes of Buffalo Hostel which enjoys a pleasant riverside location, or the Vietnamese-style backpacker vibes of Van House Homestay, or for beachside budget digs try the Beach House Homestay. Very good mid-range accommodation with city and river views can be found at the Amanda Hotel and the Riverside Hotel. Finally, $50-$70 gets you a large room with city and sea views and access to all the facilities at the Muong Thanh Luxury Nhat Le Hotel. Many famous central Vietnamese dishes can be found on Dong Hoi’s back-streets. Try the bánh nậm and bánh lọc at Hương Hoài (02 Le Thanh Dong Street). For an evening tipple, a game of pool, and backpacker socializing head to Buffalo Pub. Where to next? From Dong Hoi you can complete a round trip back to Hue by following the faster return route inland (marked in red on my map), or by riding up to Phong Nha and taking the spectacular Western Ho Chi Minh Road via Khe Sanh and A Luoi. Or, if you’re following the Beach Bum route, continue up to Phong Nha and head north through the mountains all the way up to Hanoi. 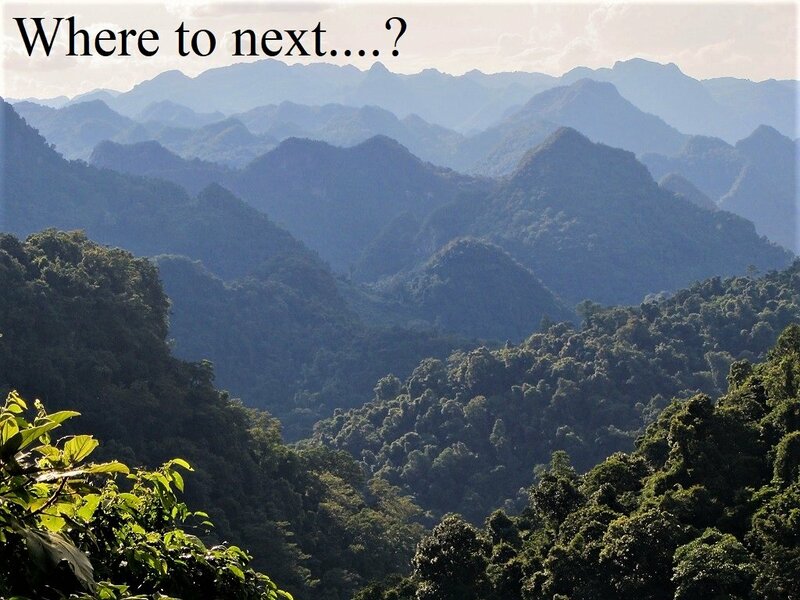 Dong Hoi is, of course, the gateway to the caves and limestone scenery of Phong Nha Ke Bang National Park, which is only a 40km ride away on good roads. 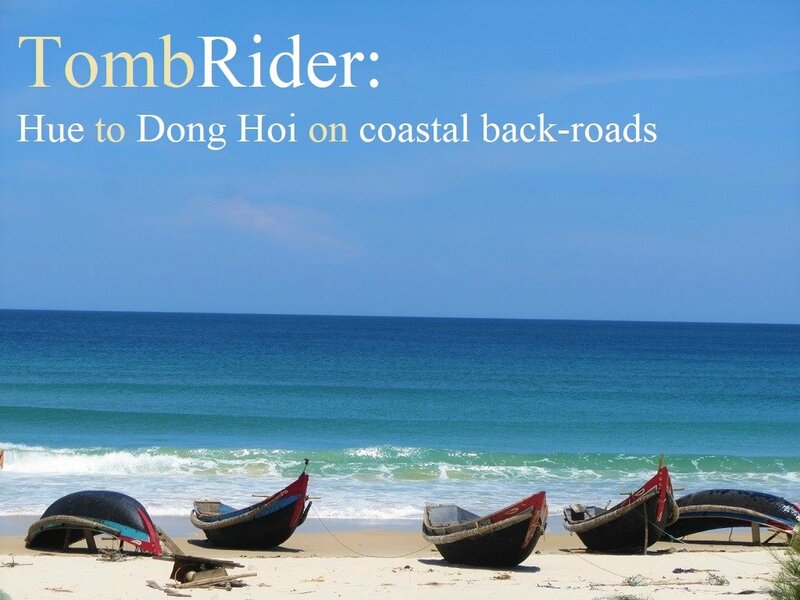 This entry was posted in ALL, Central, Coastal, MOTORBIKE GUIDES and tagged beach, Dong Hoi, guide, Hue, motorbike, road, route, Vietnam. Bookmark the permalink. Just rode from Dong Hoi to Dong Ha today using this route. 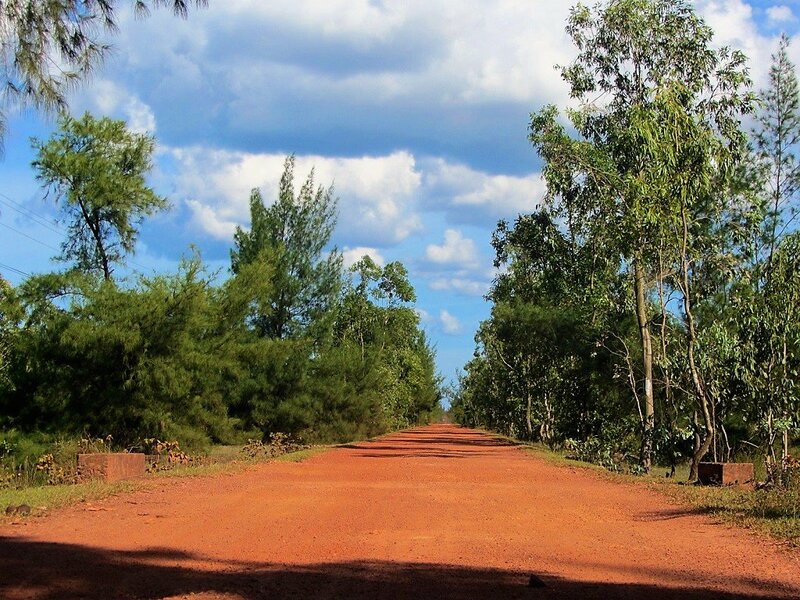 The red dirt roads south of Dong Hoi are accessible up to The FLC resort. You’ll have to turn back onto Highway 1 here but you can then take the next junction to connect back onto the red dirt roads. Thanks for the update. Good to know most of it is still accessible. What can I say, once again I had a great road trip in large part thanks to your advice. Thanks again so much for your very generous and helful insights. Just a quick update about the dirt road leading to Dồng Hới following the coast: Shortly after Bãi tắm Lệ Thuỷ you’ll now get to a booth where two security guards kindly ask you to go back to QL1 as the remaining part of that road is now a private property due to development of Dong Hoi Sun Spa Resort & Villa & Golf etc. But nothing to worry about, there are still plenty of fun beachside roads to enjoy along the coast for many years to come. Great to hear you enjoyed this route. Thanks for the update. It’s a shame you can’t get all the way into Dong Hoi on the coast anymore, but I’m glad to hear that it’s just that last section. I’m looking forward to getting back there some time in the summer. Thanks for the road updates and the hotel suggestion; very helpful. I’m going to be in Dong Hoi in a couple of days so I’ll check it out. Great to hear you had a good road trip. We were driving your route a few days ago. Half way we decided to call it a day in Tan Loi and find a bed in a guest house. Unfortunately Trung Hieu Guest House in Tan Loi doesn’t exist anymore, so next budget options were half an hour away in Dong Ha. Hope this helps improving your guide. Thank you for the update – that’s very helpful to me and to other readers. Thank you very much for this amazing guide (well..for all your guides actually!). My girlfriend and I will travel through Vietnam next August for 20 days. 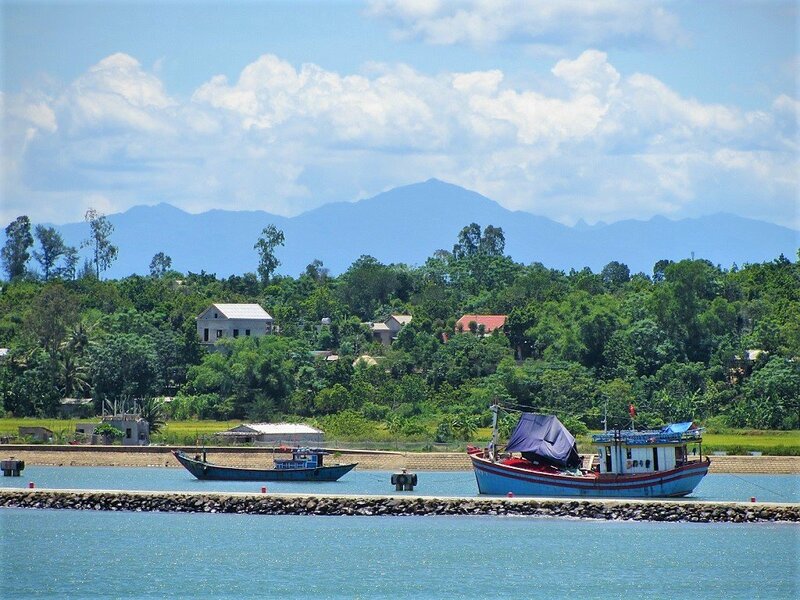 If we were to make this as a day trip from Hue and back, do you think that stopping at Cua Viet would give us enough time to get back to Hue within the day? Yes, that should be fine. But start at a decent time in the morning so that you give yourself plenty of time. Thank you for this great tour outline and the invaluable info, Tom! 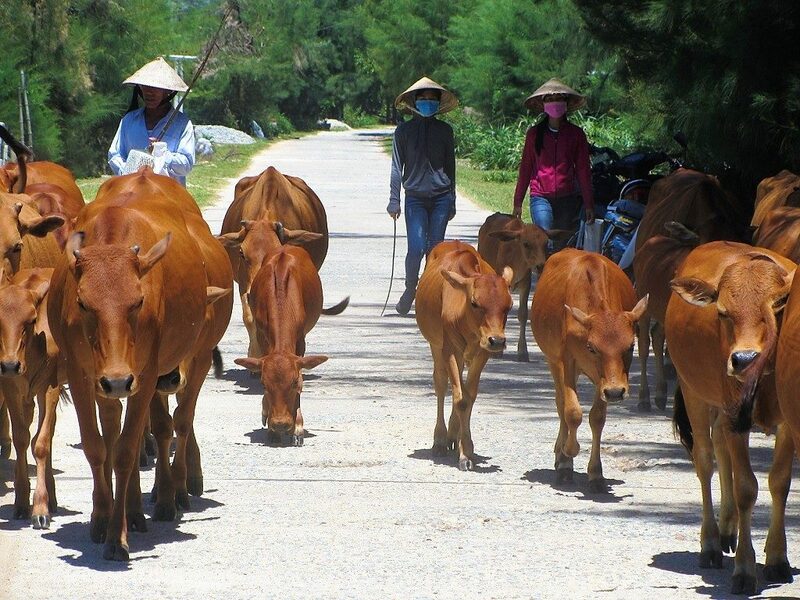 Planning to enjoy the route one-way from Hue via Dong Hoi to Phong Nha in May. – Will a simple 125cc bike suffice for this route? You can ride this route between Hue and Dong Hoi in one day fairly comfortably as long as you leave Hue at a decent time in the morning. I’d say 4-5 hours riding time. The last section on the red dirt road might slow you down, but if you’re short on time you can just continue on Highway 1 instead. I rode today the stretch from Hue to Vin Moc Tunnels. I am spending the night in a new Nha Nghi in Cua Viet, not signed on your map, neither on Google Maps. The name is Tien Tien, is next to Nha Hang Cuc Tic restaurant. A nice room for 1 person for 200.000 (initial price 250). An they cooked me a plate of rice with some other sides ,included 1(!) shrimps, eggs, tofu, meat for 30.000. The day was grey and a bit cold, but the road conditions are still good everywhere . Thank you for the updates. Good to hear there’s a new guest house and that the road conditions are still good. Shame about the grey weather, though. Yeah, shame on the weather..today was even worst: very grey and windy. The QL1a highway with the sand dunes on the sides would have been beautiful, if not for the lateral wind and the kurled pavemente that made it quite shaky. At the same time the red dirt section of the coast road is now a big gated construction site and while the guard let you pass without questioning, I suggest to avoid it for now. Also there is a stream crossing in Bao Ninh, so I turned back on the highway. Last thing:Buffalo hostel and Pub in Dong Hoi, looks like has been shut down. No words on the entrance door or on internet, but it looks like abandoned. I ma staying in Nam Long Hotel, next door to the nice Tree hug cafè. Thanks again for the updates. It’s amazing how fast things change in Vietnam – I was only there a few months ago. It’s a shame if Buffalo has shut down, although they might just be closed for the off-season which, as you might have guessed from the weather conditions, is now. Traffic out of Hue is not so bad, but it still takes about half an hour to get through the general traffic and out onto the open road. Phong Nha is only about 40km from Dong Hoi on road QL16, so it’s just about an hours’ extension onto the Tomb Rider route described on this page. But if you want to take the more direct route from Hue to Phong Nha you will need to take Highway 1 (not a nice road) to Dong Ha and then take QL15, DT10 and QL16 to Phong Nha (which is fine). My wife n I are interested in 1 day tour from Hue to Dong Hoi, (beach route) 20/4/18, I’m ok but wife concerned if any heavy city traffic to contend with? There’s not much traffic on that route so you should be fine. I want to try out this route around Christmas time but you’re suggesting it’s a bad idea because of bad weather. I’m particularly wary of wet terrain for the reasons you mentioned. But isn’t it supposed to be the dry season? Up to Da Nang at least the weather is dry that time of year. Well, yes it should be dry up to Danang (although generally it’s best up to Nha Trang) at that time of year. But the Hai Van Pass, which separates Danang and Hue, is usually the climatic barrier between south and north – the weather is often a lot worse in Hue than in Danang. But of course you never really know. The road conditions should be fine – the only bit you need to worry about is the last section to Dong Hoi – but if it’s raining hard when you get there you can just take Highway 1 instead. Thank you so much Tom – very helpful as always! I’m planning to go on this route in the next 3-4 weeks. Will give you complete feedback for sure! drove this part in spring this year. I loved it. Will come back spring next year and do it again. taking a few days for it this time. After the mountains it was my best day on the road in Vietnam! Thanks for all of this info Tom. Perfect for our planned loop ride next April. Thanks, Ed. I hope you enjoy this route next spring.